A southern Colorado landscape: Junipers, cholla cactus, prickly pear cactus, sandstone—and occasionally rabbits. I go out with Sawtooth and one of his students, walk for two hours, and get one rabbit, which is now in the pot with onions, garlic, and some of last summer's mushrooms. M. hikes up onto the national forest and comes home with a pair of compact binoculars. It looks as though their neck cord broke while someone was pushing through the oak brush. They're just Simmons, but they work. Hunting and gathering. "Damn, we're good," she says, making dinner. Libby says "I like that". I don't the hunters in this neck of the woods carry Zeiss binoculars. Or if they do, those have better neck straps! I think Chas is right...most Zeiss owners have double-checked their neck straps! It was good to get out with you...it's been a while. 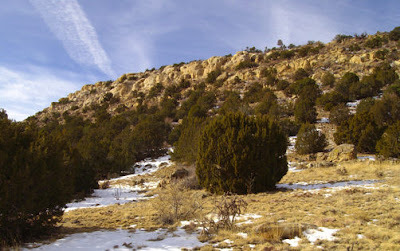 It was amazing to thread our way across snow-covered slopes dotted with pinons and cactus while following elk tracks. This is wonderfully diverse country we have!